I have noticed that both The Queen and Princess Margaret wear the orders of their grandfather George V. Since they were only 10 and 6 when their grandfather passed away, they were obviously given their orders as children. Is this still common practice? Do you know when they first appeared in public wearing their orders? Great question, Andrea! Royal family orders -- those miniature portraits of kings and queens worn on silk ribbons by royal ladies -- are the personal gift of the sovereign. Not every country has them, but you'll see them worn by ladies from a number of royal families, including the Danes, the Swedes, the Norwegians, and the Brits. Because they're a personal gift, the only way to know whether or not a royal lady has been given the family order is to see her wearing it in public. In Britain, the color of the family order ribbon changes with each monarch. According to the official website of the British monarchy, George V's order ribbon was made of white silk, though often it actually appears to be an ice blue color. 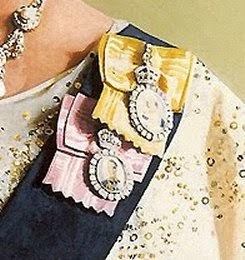 George VI's order ribbon was rose pink, and Elizabeth II's order ribbon is yellow (or, according to Buckingham Palace, "chartreuse.") The hand-painted portrait of the monarch suspended from the family order ribbon is bordered by diamonds. Royal ladies can wear multiple family orders at once, and generally the most recent monarch's order is placed nearest the shoulder, with subsequent monarchs' orders worn in descending order. 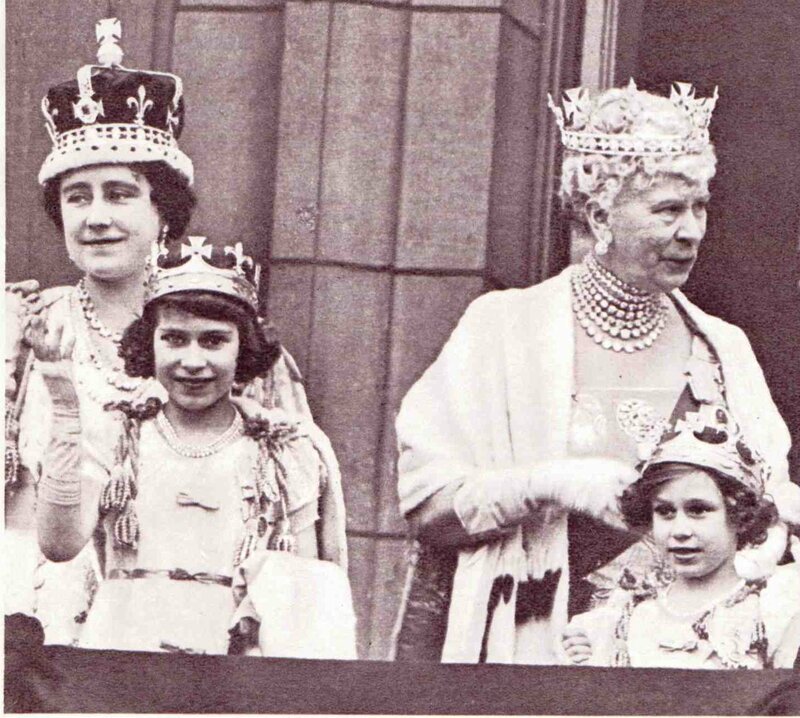 The palace's official website notes that Elizabeth and Margaret wore royal family orders at the 1937 coronation: "The Queen and her late sister, The Princess Margaret, were given their awards by their father, George VI, and both wore them as young girls at the coronation of their parents in 1937." It does appear that the girls are wearing two orders at the coronation, although their coronation robes make it a little hard to see the orders clearly. (The princesses were not given the Order of the Crown of India, which is also worn on a silk ribbon, until 1947, so both of the ribbons here must be family orders.) A sovereign's order is no longer awarded after his or her death, so the girls would have gotten the order of George V some time before his death in 1936. We have no way of knowing precisely for sure when the princesses were given George V's family order, but it does appear that the coronation was the first time that the girls wore any of their orders in public. Their opportunities to wear them any earlier were few and far between, and notably, they did not wear orders at the biggest royal event before the 1937 coronation, George V's Silver Jubilee service in 1935. You can see above that family orders were worn during the silver jubilee -- it's sort of hard to make out, but both the Duchess of York and the Duchess of Kent appear to be wearing them. However, you can also see that neither of the princesses wore their grandfather's order on that occasion. Perhaps the George V family order was a jubilee gift to the two princesses? Look closely when you next see the Queen and Princess Alexandra wearing their family orders. The Queen is the only living person who has the order of George V, and she and Princess Alexandra are the only two living people with the family order of George VI. The other Windsor women who currently have a family order -- the Duchess of Cornwall, the Princess Royal, the Countess of Wessex, the Duchess of Gloucester, and the Duchess of Kent -- only wear the family order of Elizabeth II.